Samba Band, NYC Drumline, Marching Band, Samba Reggae, Brazilian drumline-all go into the recipe of Fogo Azul NYC! We would like to thank all of you for your support in 2016! Also, we are excited for what 2017 will bring us! We definitely ended 2016 with a bang and went into 2017 with a splash. 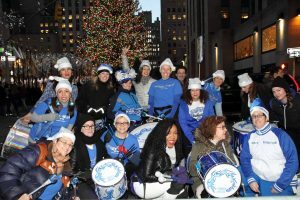 Samba Band, NYC Drumline, Marching Band, Samba Reggae, Brazilian drumline known as FogoAzul NYC enjoys the holidays! December was so much fun for us because we participated in important events. We had the honor of participating in the sixth annual Make Music Winter Solstice event in Rockefeller Plaza. 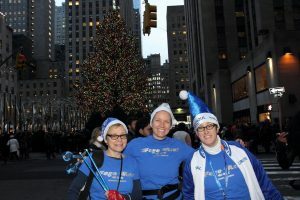 First of all, we started off in the jolly plaza by the big tree and strolled up to Radio City Music Hall. Next we moseyed our way down 6th Avenue with multiple stops along the way. Most noteworthy, we were promptly kicked out from in front of the Fox News building (Boo!) and continued on our merry way. Heading to 46th Street, or Little Brazil Way, we made merry along there to Times Square where we continued the jam with our fans and tourists! We made a lot of new friends along the way and a lot of great memories. 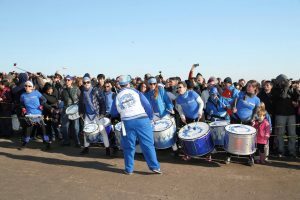 See some photos below of FogoAzul NYC Samba Band, NYC Drumline, Marching Band, Samba Reggae, Brazilian drumline! You can also check us out in The New York Times! Next, we were so amped up from this event that we couldn’t stop playing and kept playing all of the way into Times Square. Therefore we found a lot of new fans and made friends with many of the people dressed as the Statue of Liberty! Check out another video below of us playing by a new fan! Seems like everyone was dancing along with us! Most noteworthy, check out all of the people videotaping us with their phones! 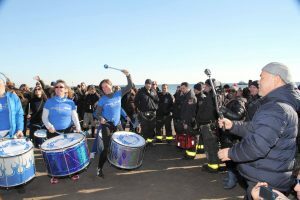 We kicked off the New Year at Coney Island, setting the beat for the annual New Year’s Day Polar Bear Plunge. Thousands of people jumped into the Atlantic Ocean to raise money for Camp Sunshine, a haven for children with life-threatening illnesses and their families. Many were in bathing suits, but many more were in costumes and wearing inflatables! It was a blast and we drummed up the energy for a good cause! 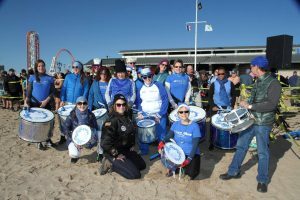 Check out this video of FogoAzul NYC at the New Years Day Coney Island Polar Bear Plunge! 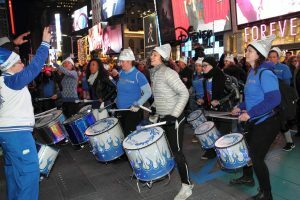 FogoAzul NYC, The only All Women Brazilian Drumline, Samba Band, and marching band in New York City! would love to wish you all a happy new year! As we move into 2017 we are unsure of what our future holds during the next 4 years. We hope that the United States continues to progress in the positive direction it has over the past decade. Finally, we are always looking for women who want to be a team member in the band, therefore we would love to see you at our next rehearsal! 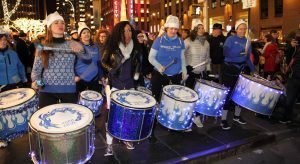 Samba Band, NYC Drumline, Marching Band, Samba Reggae, Brazilian drumline FogoAzul NYC is open to all women identified humans. No experience is necessary. We give you the drums and costumes and the tools to learn our music. While one does not need to have “rhythm” (we believe everyone has it deep down somewhere) and there is no need to be able to read music. Just an open mind, good attitude, and love of music and dance! Hi Stacy, do you put out a list of upcoming events for your supporters to walk in the background? I had been to a few classes in Brooklyn, thinking I could commute every week from NJ, but it didn’t work out. I’d LOVE to be a groupie though! You guys were awesome at the Polar Bear Swim.You made it a great day.My first swim was on the 100th Anniversary swim with about 20 guys.I am a big fan now. Hi Paul! Thanks for the kind words! COMe say hi to us next time you see us! !